Easy to Learn Korean 974 – A sudden urge to do something unusual. 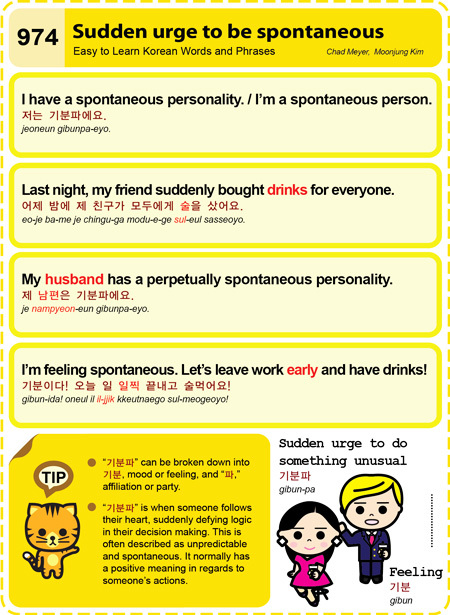 Posted in Series	| Tagged drinks, feeling, friend, husband, last night, leave work early, person, personality, sudden urge to be spontaneous, sudden urge to do something unusual, 기분이다! 오늘 일 일찍 끝내고 술먹어요!, 기분파, 어제 밤에 제 친구가 모두에게 술을 샀어요., 저는 기분파에요., 제 남편은 기분파에요.